President Reagan’s second-to-last resting place. Starting Wednesday evening, former President Reagan will lie in state in the U.S. Capitol Building in Washington, D.C. Reagan’s coffin will lie on Lincoln’s “catafalque” within the rotunda. What is a catafalque, and why does the United States still have Lincoln’s? Briefly, it’s the second-to-last resting place of America’s most distinguished deceased. “Catafalque” is one of those words that most of the time exists solely to stump children in the National Spelling Bee. (In the fifth round of the 1999 bee, documented in the film Spellbound, young Anisha Kshetrapal of Naples, Fla., spelled it “catafalc,” offering future journalists a handy reference for the word’s proper pronunciation.) The term, from the Italian catafalco, or scaffolding, refers to the raised (and often movable) platform that a casket rests on during a funeral or memorial service. The most notable Italian catafalque was the one designed and constructed by Michelangelo’s fellow artists for his 1564 funeral at Florence’s Santa Croce. Abraham Lincoln’s catafalque, hastily designed and built in 1865 by Commissioner of Public Buildings Benjamin Baker French, is a nailed-together platform of rough pine boards about 7 feet long, raised about 3 feet off the ground and covered with a black cloth drapery. 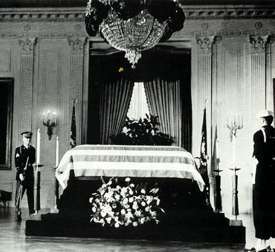 After Lincoln’s funeral, the catafalque was permanently stored in Washington’s Tomb. This space, a tiny cell two floors below the Rotunda, had lain vacant since 1832, when plans to disinter the first president from his resting place in Mount Vernon fell through. The decision to use Lincoln’s catafalque usually goes hand-in-hand with the decision to grant a deceased luminary the honor of lying in state in the Capitol. (Congressional leaders generally work with family members to make that call.) Twenty-six distinguished Americans have lain in state on Lincoln’s catafalque, including 10 presidents—from Lincoln himself through Kennedy to, most recently, Lyndon Johnson in 1973. Bonus Explainer: President Reagan’s funeral procession Wednesday evening will be rich in traditional, and obscure, military funerary detail. In addition to a caparisoned horse—a riderless horse with a commander’s boots reversed in its stirrups, meant to symbolize one last look out over his troops—the procession will feature Reagan’s casket carried upon a “caisson.” A caisson traditionally refers to a horse-drawn cart used for transporting artillery, munitions, or other battlefield supplies. In this case, the funerary caisson—and the six horses drawing it—will be supplied by the 40-soldier Old Guard Caisson Platoon of the Military District of Washington’s 3rd U.S. Infantry Regiment. The platoon’s caisson was built in 1918 and originally used by the American Expeditionary Force as a transport wagon for a 75 mm cannon. Its wheels are cared for by Amish craftsmen using old-world techniques. Oh, and, of course, “caisson” was spelled “cason” in the fourth round of the 2001 National Spelling Bee by Aaron Dinkledine of Kokomo, Ind. Explainer thanks Eva Malecki of the Office of the Architect of the Capitol.